Busy Buzzings Around the Ant Moats! Dawn through early morning would definitely be the best time to catch local bird action around your yard. But let’s face it, not all of us are early-birds and busy schedules don’t always permit those few spare minutes of enriching watch time. With southern migrations underway for many species, it’s a great time to catch the action! Dusk and the hour or two prior offer almost as much (if not more) backyard bird action. Sitting on the deck last night with about 25 hummingbirds furiously buzzing about seemed almost magical. Sure we’ve had the sprites here all summer, but fewer numbers. Going through 15 pounds of sugar to keep 8 feeders filled and fresh over the last two weeks or so has been extra work but rewarding. So as not to waste a drop of nectar, the ever important ant moat is a true life saver, for the birds and for the wallet! If you’ve been feeding hummingbirds for any amount of time, it’s likely you’re familiar with the handy-dandy device, but if this is season one of your new hobby, know that one little ant moat will save a whole lot of nectar! 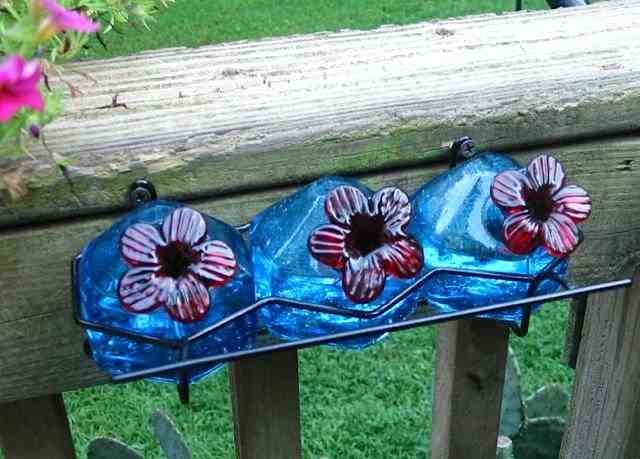 Because ants can’t swim, feeders stay protected from the pesky things. But you must keep the moat at least half-full with water. Ants emit something truly nasty to hummingbirds, and it only takes one to ruin a whole feeder full of fresh nectar. With the feeding frenzy going on now, this is a big fat bummer for hummers! If you’ve had a few sprites visit but are not really seeing them now… something’s wrong! Either nectar is not fresh, there are ants around, or even worse, yellow jackets 🙁 You can minimize the latter by keeping the outside of feeders clean, if they sway or leak, it’s an invitation to the nasty fliers. 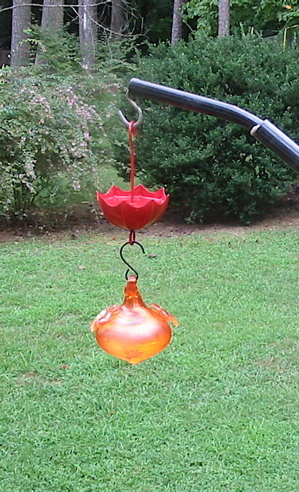 Save money and provide hummingbirds the best nectar by making your own! It’s just plain table sugar and water… that’s it! No red dye, and nothing else for the solution as it’s harmful to their health. 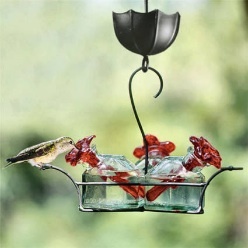 The standard ratio is 1:4 (1 cup sugar to 4 cups water) but at busy migration times when the hummingbirds are trying to fatten up for the long journey, the solution can be stronger, thus offering more calories. We go 1:3 when they arrive and when they depart. Treat them well with fresh water sources (like a leaf mister shown here) and fresh food and they’ll grace your place next year. Site fidelity is another cool characteristic of these most intelligent birds! If you put forth a little effort to help migratory birds on their way, you can sit back & enjoy the show. Not just for hummingbird feeders, the all-important ant moat will protect nectar in butterfly and oriole feeders, they’re ideal for jelly feeders too! Ants adore sweet sticky anything, so as long as there’s a hanger, you can use an ant moat. It just comes between the feeder itself and the hook from where said feeder will hang. Because ants can’t swim, the water inside the moat keeps them from reaching nectar. The pesky things must exude something quite distasteful as one single ant ruins a whole batch of nectar in the feeder, hummingbirds won’t touch it! Basic colors are red, black, clear and orange for orioles. Some oriole and hummingbird feeders offer built-in moats, but they must be maintained and filled with water to serve their purpose. Let the moat run dry and like magic… ants will appear if they’re anywhere in close proximity. Here’s a great “how to” video to make your own ant moat. So if you’re the crafty type, and have the time and patience to do these kind of projects, check this video, and ants be gone for good! Why Use an Ant Moat with Feeders? Sugar, anything with sugar is bound to attract ants! 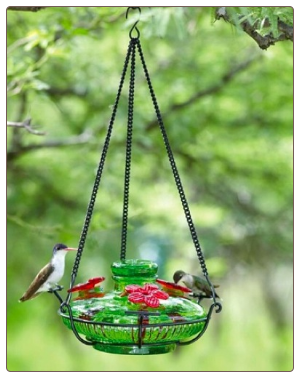 Be it hummingbird, oriole, butterfly or any fruit & jelly feeder… ants will find them-especially in hot, dry weather. 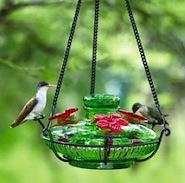 They spoil nectar for hummingbirds, the sprites will not drink from a feeder containing ants. Same goes for grape jelly and oranges set out for orioles, and even butterfly feeders offering nectar. Ants must exude something quite nasty as it only takes one to ruin a meal. The most basic ant moat is simplistic in design, an upside-down umbrella or cup that holds water. Ants drown when trying to cross water. Some prefer to coat the inside with petroleum jelly instead, which also acts as a barrier for ants. To slow water evaporation, you can a drop or two of cooking oil to the moat’s water. 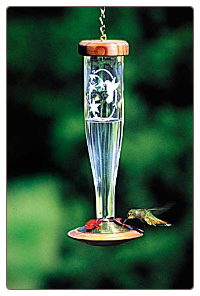 Etched hummingbird feeders shown above have unique wood tops and bases and offer their own optional ant moat. With sleek style and matching wood grain, this type of moat features a grooved underside containing an anti-ant substance that lasts for several years. It’s neat and clean with no filling required. Parasol crafts a mean ant moat, in red or black it looks like, well… a parasol! We’ve seen goldfinches actually drink from these on hot summer days, even though several birdbaths are always kept clean and full! 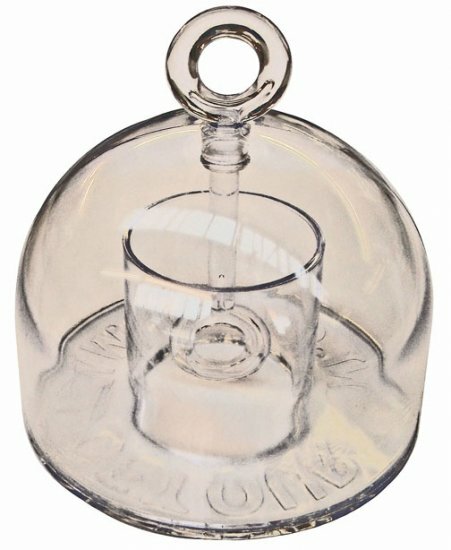 The ant moats work well with any feeder, regardless of how many vessels. 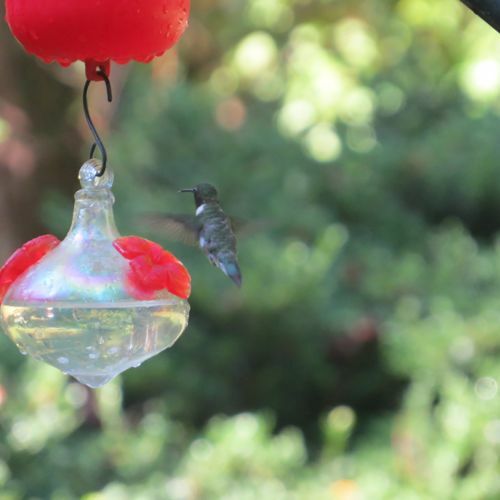 You can feed hummingbirds without attracting pesky ants… of course using a no-drip feeder really helps. As for bigger pests? We caught a raccoon red-handed, drinking from a feeder on the deck the other night. He had both hands wrapped around the feeder, guzzling like it was beer! New solution: bring said feeder inside at night… dang! It can’t be time for the ant moat yet? Dry, dry, dry, it’s been a hot and dry start to summer in the Southeast, which means crawlies of all sorts are already seeking moisture. Pastures are starting to turn crispy as the lush grasses of spring fade away. Sticky nectar solutions we use to lure hummingbirds are always a major attraction for ants, who can become a real nuisance to birds and humans. The tiny sprites just don’t like ants in their nectar… period! 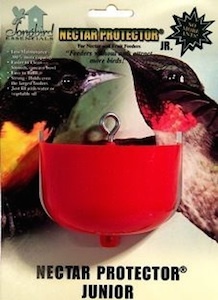 Another option is to dab some petroleum jelly on the hook or bracket of the feeder. This works okay for a bit… until the heat melts it and makes a mess. You’d want to be sure nothing drips into the nectar as well. Lots of hummingbird activity in the beginning of the season seems to have slowed, and even has folks asking where they are? Because flowers and vines are still offering food sources by way of nectar, they’ll always be the first and most natural choice. Due to the harsh winter and late spring, blooms don’t seem to coincide with the time! Our cactus which usually flowers in may, is now in full bloom one month later. than normal. 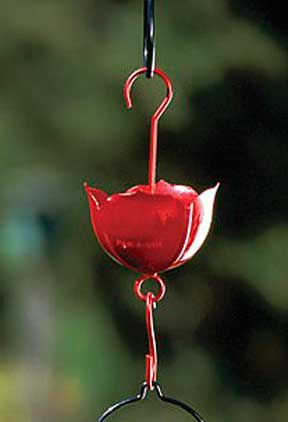 But come July when everything has shriveled, hummingbird activity is sure to increase once again at feeders, so don’t take them down, and do keep nectar fresh. Pouring too much of that nectar down the drain? First, don’t fill feeders to capacity, and do try the home-made sugar water solution. It’s perfect, and we think hummingbirds prefer it over commercial mixes! No red dye needed either. This simple recipe? 1 cup plain table sugar to 4 cups water… that’s it! Boil just one cup of water to dissolve sugar, add three cups cold water, stir well… and you’re ready to fill. Store unused nectar in the fridge f or up to two weeks. May the tiny sprites bring a smile upon your face, and may you see lots of buzzing activity around your feeders this season! With the big migration underway, it’s a hectic and busy time of year for hummingbirds! It’s not the temperatures, but rather the number of daylight hours which dictate migration. This natural occurrence, along with instinct tells the tiny sprites it’s time! 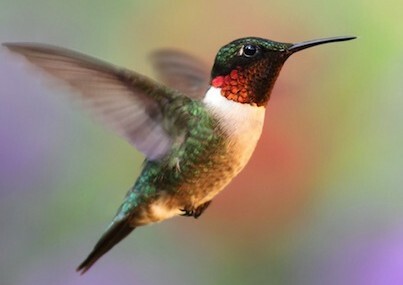 For their long journey back to Central and South America, hummingbirds will need lots of energy, and feeders are a critical source for that food. Due to extreme summer weather conditions around most of the country, many hummingbirds have become accustomed and/or dependent on them. Be sure nectar is always fresh and sans the ants! If the water in your ant moat seems to evaporate quicker than you are filling feeders, this little trick will help slow the process. Cooking oil. 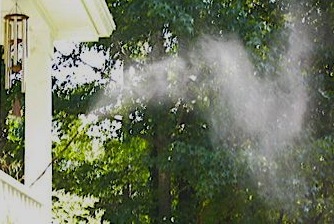 Yes; corn, olive, peanut, any kid of cooking oil added to the water will greatly help slow evaporation. Just a drop or two will do it, and you’ll always be covered in the pesky ant department! The Mini-est of watering holes? the ant moat! 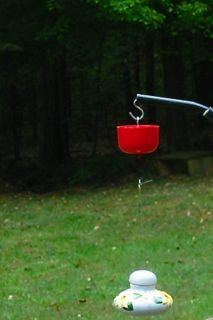 Well of course I was sans the camera when a Titmouse landed on the bracket where the hummingbird feeder hangs. Above that is a moat to keep the pesky ants at bay and out of nectar. The bird hopped down and perched on the moat, drinking, drinking and drinking again. After this incident I kept a closer watch, and noticed other small songbirds had the same idea. It seemed strange to me because there are nine birdbaths, two misters, and one fountain around the place! Yes, it’s a job in itself taking care of everything in the yard, but when you’re a backyard bird fanatic… these things happen! Luckily the afternoon storms have started in the Southeast, bringing rain, wonderful rain! “Crunchiness” is turning green, and plants are looking much healthier. I wish for all drought-stricken areas the rains would come. Even on Facebook, I’ve seen rain dances and rain prayers throughout the daily feeds. Now usually when it’s hotter than Hades out there, a few drops of salad oil are added to the water inside the ant moat. This addition to the moat water helps to slow evaporation. But after discovering birds drinking from the smallest birdbath in the world… we had to nix the oil. Be kind to birds and wildlife if your area is parched. Simply placing a shallow bowl or pan of water on the ground will make an excellent refuge for many crawly, winged, or other wild being! The tiny sprites are mesmerizing, you could sit and watch their antics for hours if time allowed! Definitely one of the most endeared birds, hummingbirds are in a class of their own. A magical experience to have them around your place during the season. What’s not so magical is the fact that ants love sugar water too. (Yes, nectar is simply sugar water you can easily make yourself- recipe link at the end). Without fail, pesky ants will find a way to invade the sweet, sticky nectar, and when they do, hummingbirds won’t drink the solution. So you end up with wasted nectar and a bunch of ants, some dead, some still alive. They’re dead because they can’t swim… silly ants! That’s why ant moats are so perfect with these feeders. 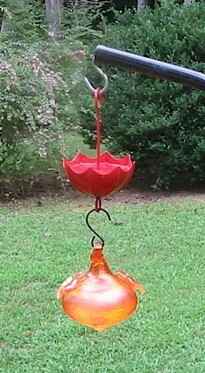 Placed above the hummingbird feeder, the ant moat holds water, and ants can’t cross the water successfully. The ant moat usually has a double-end hook, so the feeder hangs directly from it. The top hook on the ant moat is basically the main hanger. It’s a one-time investment, and very reasonable considering the results. 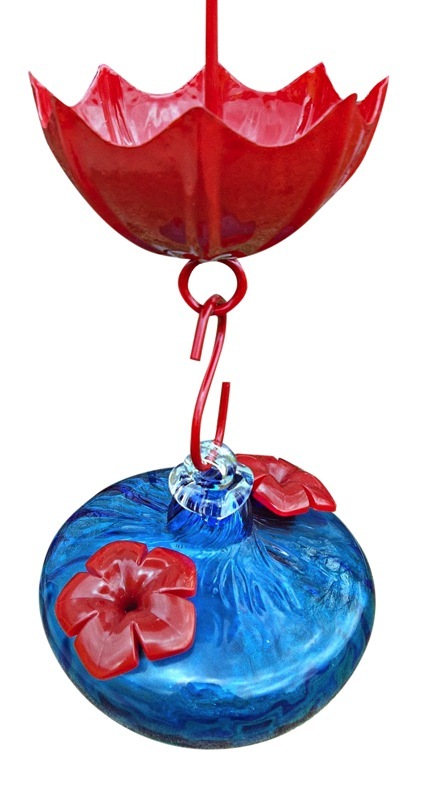 You’ll save nectar, save money, and your hummingbirds will be happy too! Oh yeah… and the really simple nectar recipe can be found here.